Hi friends! November has been a blur of activities and get-togethers so I wanted to stop in today with a super easy “how-to”. These candles make great hostess gifts, or they are just a fun way to dress up some candles you have around the house for the holidays. Recently I saw that jar candles were on sale at AC Moore 4 for $10. Personally I think some of their candles smell pretty great, they just don’t look very pretty. Here is a super simple way to fix that. Decals– also called “rub on transfers” I really like this holiday booklet of decals as it comes with a lot that are not Christmas specific. I especially like the houses. You can also find rub on decals at most craft stores like AC Moore, Michaels, etc. I actually found my set at a thrift shop last year and am glad to finally put them to use. Greens– these are of course optional, but I think add a little something nice. Clip a few from your Christmas tree, clip a little while on a walk in the woods, etc. Labels-I am currently in love with these stretchy label tags from the new Martha Stewart for Staples line. I think they work well for gifts that you probably wont wrap like jars, flower pots etc. 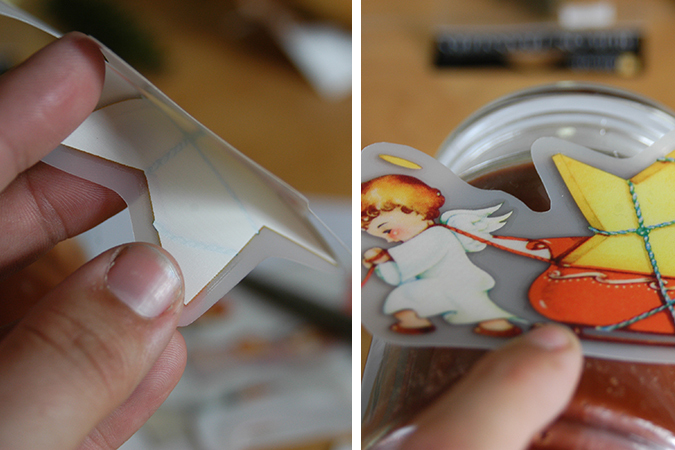 But you can always tie a string with a paper label around your candle instead. 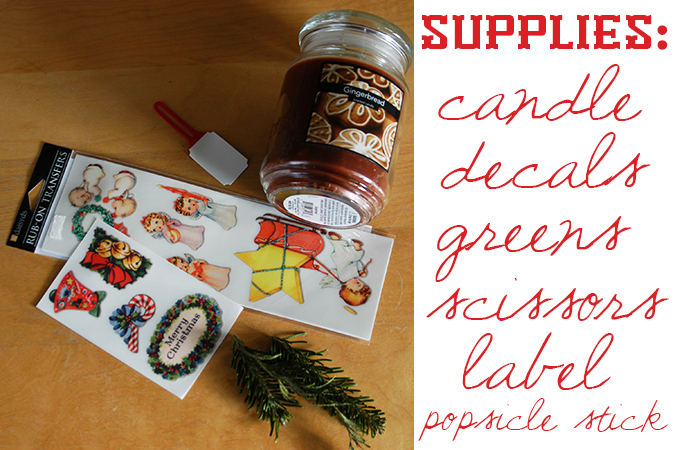 You could also use the label to write what scent the candle is. Popsicle stick-these normally come with the rub on transfers, and you just need a blunt object like the stick for rubbing your decal. 1. 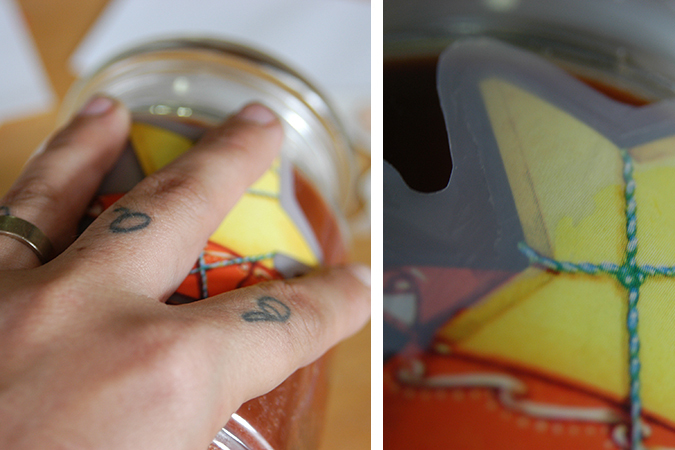 Peel off your label. If you have any trouble with sticking paper or glue you can use a product like Goo Be Gone to clean it up. Make sure the glass is clean and dry. 2. Cut out your decal. 3. Your decal will have a plastic sheet on the top and a paper backing. Gently pull off the paper backing. 4. Lay your decal down on the candle with the plastic sheet side up. And smooth the decal out. It will stick to the candle. 5. Once your decal is smoothed down you can begin to rub it with the popsicle stick. You will be able to see which areas have been rubbed as they will come away from the plastic sheet. Do not pull the plastic sheet away or you can tear your decal. Keep rubbing the entire thing until the plastic sheet naturally falls away. Now your decal is adhered. I burned a sample candle for a few hours and did not notice any change in the decal. 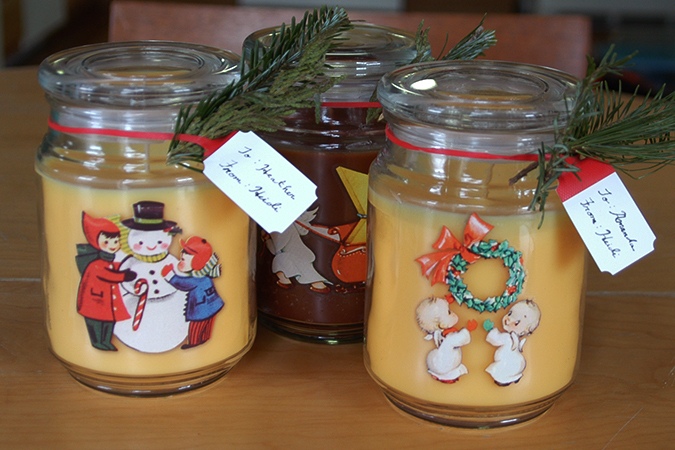 Besides candles you can also use decals on plain jars and fill them with candy, plain colored tins and fill them with Christmas cookies or baked goods. I think they add a nice festive touch and are super quick to make. Hope you enjoy! 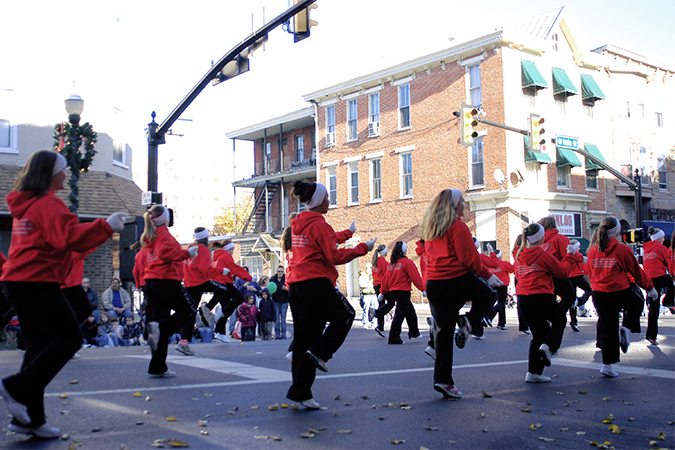 Yesterday was the 56th annual Holiday parade in Waynesboro. We walked downtown with blankets and chairs as usual. It was sunny but still very chilly. 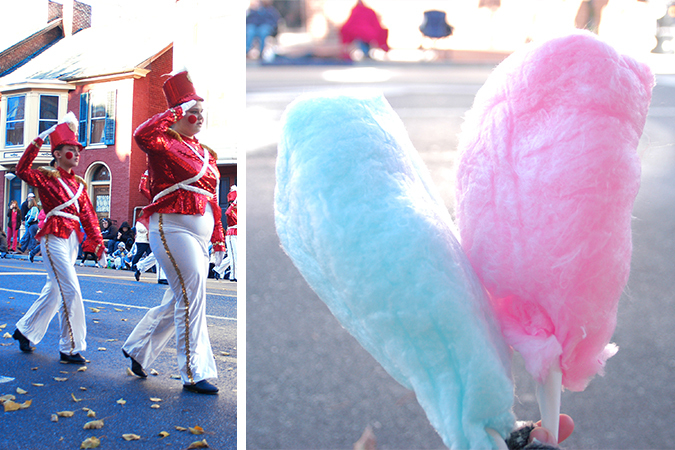 There was cotton candy, and scrambling to collect the candy thrown from the floats, cute dogs dressed as angels, a scary Christmas bunny costume, and Santa on a tractor covered in snow! Now the big tree in town square is lit, and all the wreaths are up around main street. The local radio station has begun to play Christmas music round the clock, and this leads me to believe it is totally appropriate for us to start decorating for Christmas. 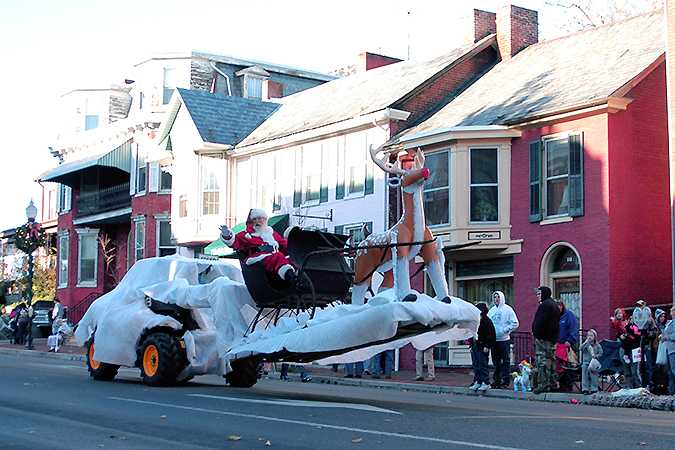 For me Thanksgiving and Christmas are sort of one big holiday rolled into one, so let the decking of halls begin! I know you’re going to think I’ve gone totally crazy (posting snowmen in Sept?) but I promise I’m not starting in on Christmas posts yet! I found this roll of brand new never used vintage snowman paper at the thrift shop this week as I was dropping off 8 bags of donations. I had cleaned out my youngest son’s room and went through all of my clothes. 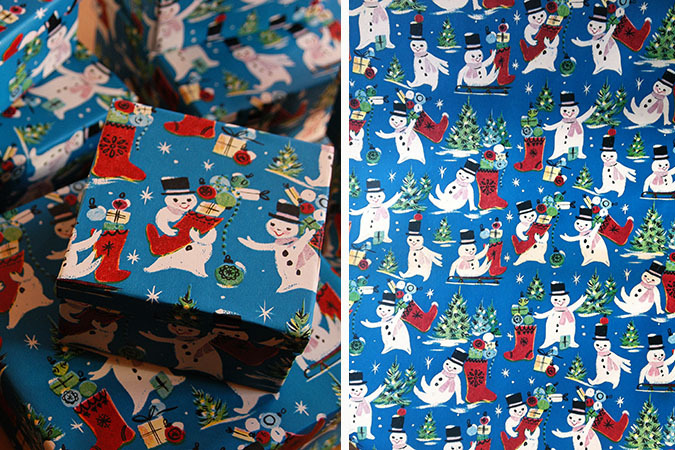 I felt like it was the best reward to find this wrapping paper for 75¢ and surely the thrift shop workers thought I was a bit nuts over wrapping paper, but its just so great! I decided that while I wanted to use it to wrap gifts, I didn’t want it ripped off and thrown away. So I went out and bought some paper mache boxes with lids to cover (using spray glue) and it worked out really well. I plan to display a stack of them with my Christmas decorations. Then those can be used to store ornaments. 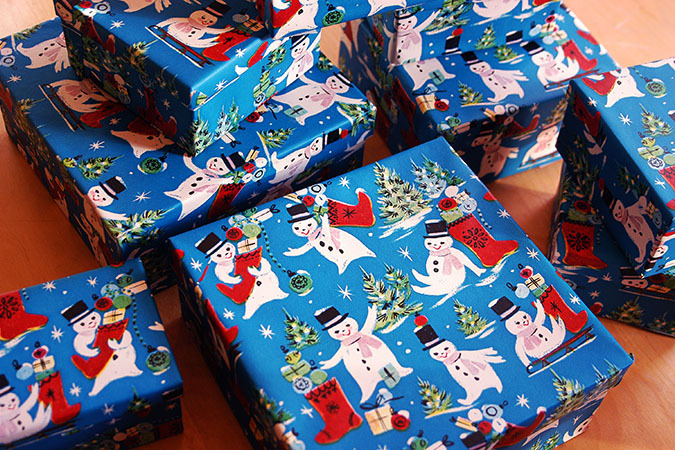 Then a bunch of gifts will be “wrapped” in boxes to give to others. I will however only be giving gifts in them to people who I know will love and appreciate the boxes (and want to save them haha). Since its a nice sized roll I covered all these boxes and still have enough to cover 3 or 4 really big paper mache boxes. 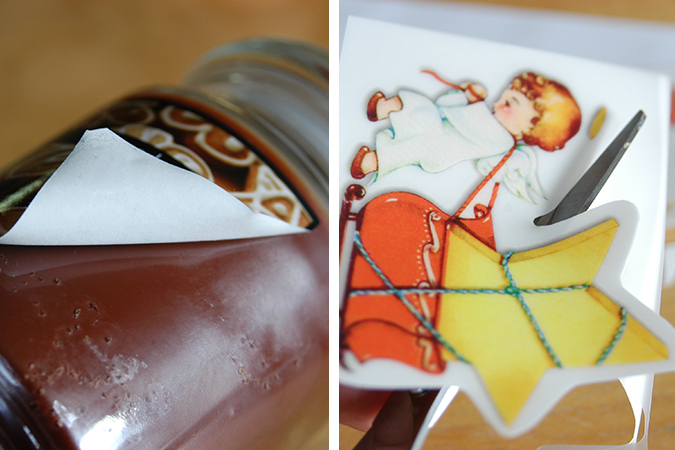 Besides vintage paper I think this idea would be great for saving any wrapping paper you really love.